From the controls to the discharge assemblies, Lancaster Mixers are designed and built with the end users in mind. We build rugged and reliable machines that are intended to operate for years with minimal maintenance. Every design enhancement we’ve made over the years has been driven by improving performance without adding unnecessary complexity. Our utilitarian machine philosophy has served our customers well over the years, as they get the most efficient powder mixing and pelletizing technology on the market without any superfluous features. Less complicated machines mean easier and affordable maintenance. Every part on the mixer is designed for practicality to enhance the machine’s capabilities. Lancaster Products machines are built to simplify maintenance so that the end user’s staff can perform routine service which allows for increased operating time. Our spare parts follow the same philosophy with a practical design that avoids unnecessary costs by using standard off the shelf parts instead of custom designed parts that are difficult to source. The normal replaceable, direct material contact wear items are the rotor, blades, plows, and side scraper. All of these parts are designed for quick replacement by our customer’s maintenance staff to minimize downtime. The inner flap seal and discharge valve seals are other commonly replaced parts that are designed for quick change outs. The pinion gear driving the pan is an advanced nylon which does not need lubrication and with normal preventative mixer maintenance can last for decades. Our bearings and motors are off the shelf parts that can be easily and quickly sourced for replacement or repairs. Many of our high shear mixers are used for multiple processing applications which means product line switches must be quick and thorough. The pan design includes a sidewall scraper to keep the pan sides free from buildup and a plow to keep the machine bottom clear. The inside of the mixing cavity is a smooth surface that doesn’t lend itself to material accumulation, and if needed, the mixer can be customized without liners or with welded and polished liners to remove any chance of material remaining in the liner joints. The bottom discharge feature built for rapid discharge as gravity and the plow evacuate the mixer quickly and thoroughly. The pan top of all Lancaster Mixers is designed to have a flat inside surface with no bearings or seals protruding into the mix area. This allows for easier pan cleanout and easier maintenance of the bearings and seals of the mixer. For manual cleaning, the top pan lid can be opened to power wash the mixing cavity and tooling. Optional spray bar or nozzle options are available to ensure a complete clean out. Lancaster Mixers can be customized to meet the demands of the most exacting customers. Commonly customized features include porting and discharge, dust collection, motor sizes, pan and tooling materials, high speed tooling style and controls. In many cases, our high shear mixing machinery is incorporated into larger material processing systems where the flow of material is already established and can’t be reconfigured. 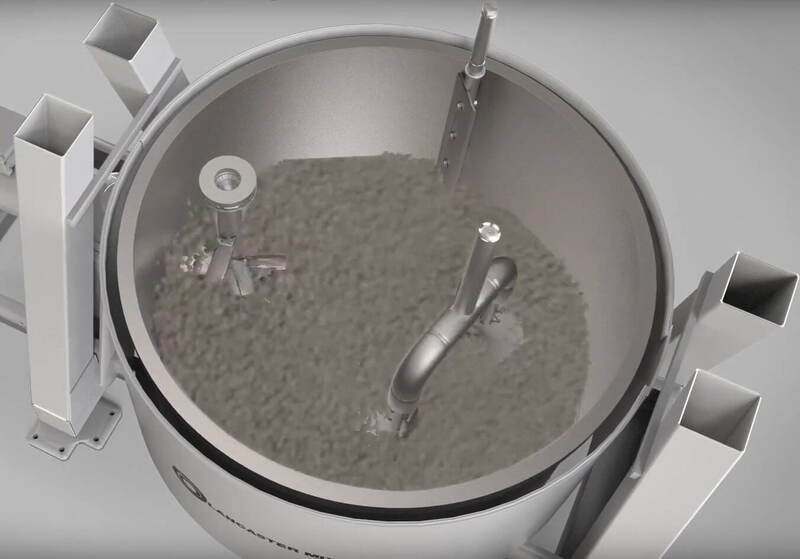 We have the ability to customize inputs and discharges in our mixers to accommodate these situations, so you can get the right size mixer to process the volume of material required without having to re-design or re-build your entire system. There is quite a bit of flexibility in configuring mixers for our customers to satisfy other requirements as well. Less time invested on operator training and downtime, lower maintenance costs, longer lasting machinery, and readily available spare parts make for a lower overall cost of ownership over the lifetime of our machines. Lancaster Products High Shear Counter-Current mixers not only improve process efficiencies for our clients but also reduce maintenance and replacement costs over time. Contact us today to learn more about the benefits of partnering with Lancaster Products for your materials processing needs. 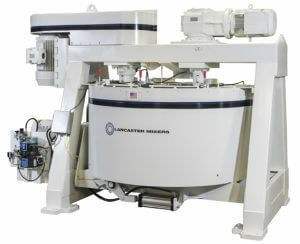 Lancaster Products High Shear Counter-Current Mixers are highly effective in their ability to mix and pelletize in one machine and one process, but Lancaster Mixers are also built to last. Many of our machines are still operating after decades of use. We continue to supply parts to many vintage year machines still in operation. Lancaster Products machines are built with a robust construction that provides structural durability and are designed to allow for replacement of wear parts as needed to extend the operational life of our machines instead of total machine replacement. To our customers this translates to lower Total Cost of Ownership and higher return on investment than other mixers. With proper maintenance, Lancaster Products mixers are very long-lived machines.